Famed as the Salt Capital of China, a treasure house of dinosaur fossils, and the Lantern City of Southern China, Zigong City is located in the south of the Sichuan Basin. It has been recognized by the State Council as a State-level Historical and Cultural City. The area includes over 70 scenic resorts, including the Zigong Dinosaur Museum, ruins of the ancient salt capital, Wangye (Imperial Highness) Shrine, and the Grand Buddha of Rongxian County. The Zigong Dinosaur Museum is world famous, and the International Lantern Festival is a folk activity that Continues long traditions. The International Lantern Festival in Zigong is a cultural gathering that continues long traditions among the local ethnic groups. The magnificent creations reflect the ingenious skills of the local artisans. The lanterns blend with the local landscape to create images of mystery and imagination. 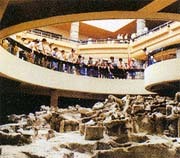 The Zigong Dinosaur Museum is located in Dashanpu, I I kilometers from the city. Hundreds of complete dinosaur skeletons and the remains of many prehistoric mammals have been preserved and are on display. Among the most famous is the 10-meter tall Sichuan Emei Dinosaur. Located in the city center along Jiefang East Road, the Zigong Municipal Museum of the Salt Industry is the only museum in China relating the history of the vitally-important salt industry in ancient times. On display are salt processing techniques, drilling equipment, and evidence of the advanced level of salt mining in Sichuan during ancient times.